Lettuce wraps are gaining popularity as the warmer weather arrives and we attempt (I’m trying!) to eat healthier. 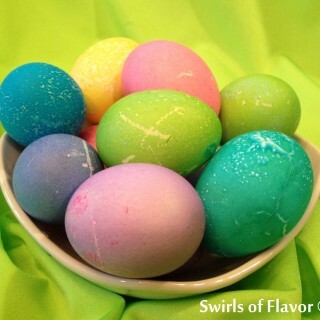 Because, let’s face it, bathing suit season is quickly approaching! Skip the high carb bread and just wrap in lettuce and you’ll be happy you did! 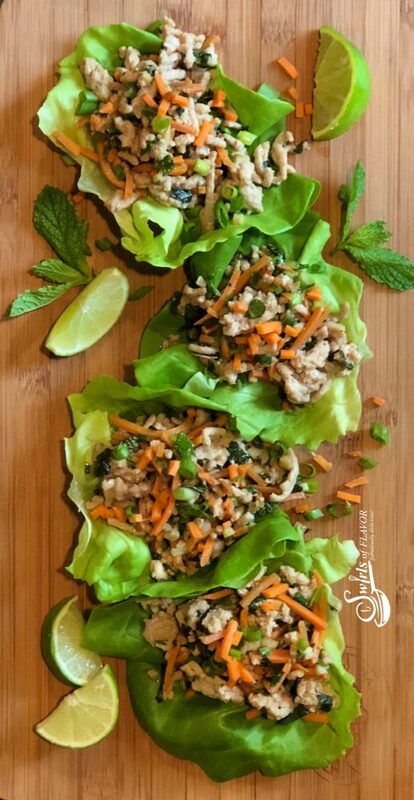 Thai Chicken Lettuce Wraps combine ground chicken with fresh ginger, garlic and Thai basil for a burst of Thailand flavor! A quick cook on the stove top, spoon into lettuce leaves and drizzle with fresh lime juice and your taste buds will thank you! 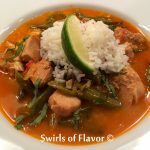 I visited Thailand years ago and have vivid memories of the flavorful foods, especially the street foods that are readily available on the sidewalks along with tables to sit and eat at. Did you know that most apartments in Thailand don’t have a stove? Yep, that’s right, they just head on down to the outdoor vendors, get some food and sit down at an outdoor table to dine with other neighbors. Quite a concept! 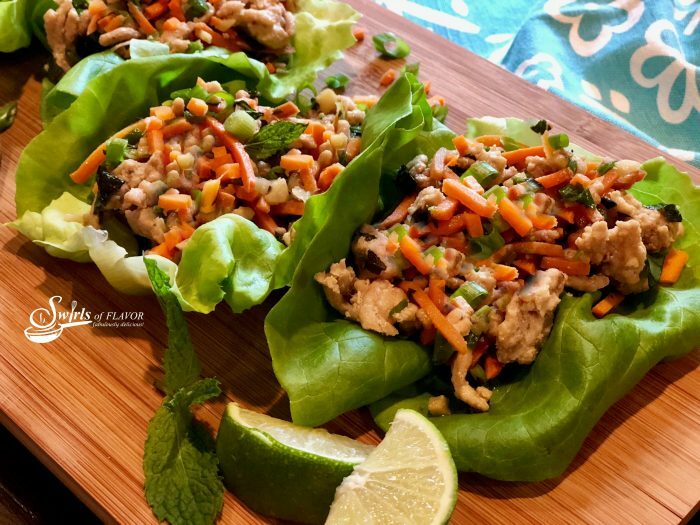 So why not cook up a batch of Thai Chicken Lettuce Wraps and invite some neighbors over to dine “Thailand style” together on your picnic table? It will be fun! 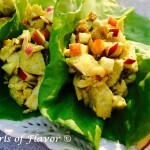 If you love the idea of lettuce wraps then be sure to give Curried Chicken Lettuce Wraps a try. 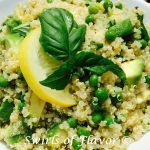 You don’t even need to cook for this recipe! Just toss cooked chicken with chopped apple and sliced almonds for a bit of crunch, raisins for bursts of sweetness, and red onion for just the right amount of savory with a creamy mayonnaise flavored with curry powder and fresh lime and wrap it up in lettuce leaves. Prefer to fire up the grill for some summertime goodness? 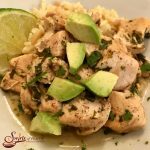 Grilled Chili Spiced Chicken With Cilantro Lime Gremolata will soon become a go-to summertime favorite with it’s fresh flavors sprinkled over perfectly seasoned chicken breasts. And you’ll definitely want to serve up Strawberry Basil Margarita Chicken brimming with the sweet juiciness of strawberries, fragrant aroma of fresh basil and the lime flavor of the must-have summertime Margarita cocktail. 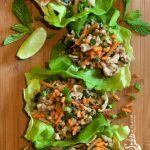 Thai Chicken Lettuce Wraps is an easy dinner recipe bursting with fresh ginger, garlic and Thai basil, that cooks on the stove top and is served in buttery lettuce leaves with a drizzle of fresh lime. Heat sesame oil in large non-stick skillet over medium heat. Add ginger, jalapeno, garlic, soy sauce and kosher salt and cook until fragrant, about 1 minute. Add ground chicken and cook 5 minutes, stirring occasionally. Stir in carrots and scallions and cook until chicken is no longer pink and cooked through, about 2 minutes. Remove from heat and stir in mint and basil. Divide chicken between lettuce leaves. Drizzle with lime juice. Garnish with additional shredded carrots and scallions, if desired, and serve with lime wedges.